This week has been a week of culinary experimentation as I have started my own sourdough (post to follow) and for Shrove Tuesday the Gorgeous One and I had beef, pepper and onions rolled in pancakes using my pancake recipe minus the cinnamon. 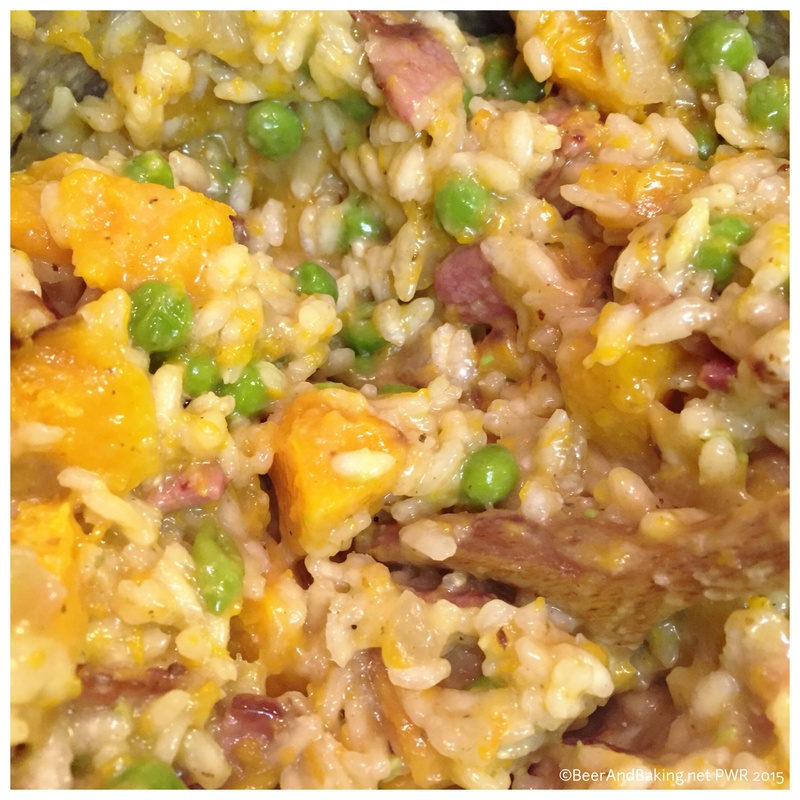 But the one recipe I was really proud of was Bacon and Butternut Risotto. I have made butternut squash risottos before however they were a little on the sweet side, which I liked as I have a huge sweet tooth but a bit too much for the savoury loving Gorgeous One. It is amazing how the addition of one ingredient can completely transform a dish. 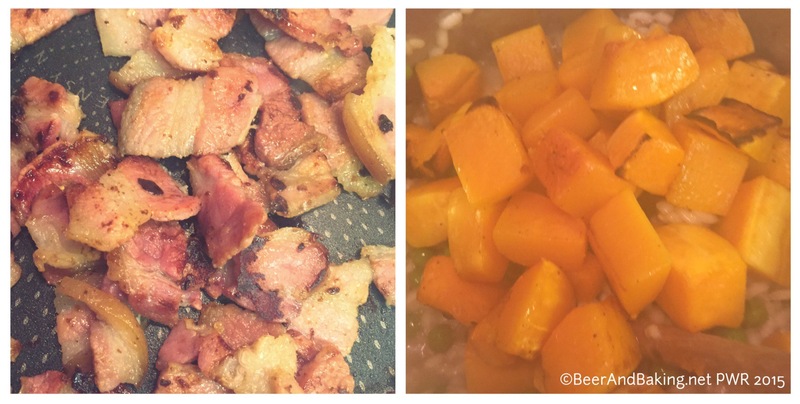 The smoky, slightly salty taste of the bacon superbly compliments the sweetness of the butternut squash. Preheat the oven to 180oC. Peel the squash and cut it in into 2cm cubes. I find the easiest way to do this is to slice horizontally and then cut into cubes; this also makes it easier to deseed the fat end. Sprinkle with a little nutmeg and pop in the oven for 30mins on the top shelf. To save having half a butternut squash around it might be worth roasting the entire squash and using the already roasted squash to make soup. As I don’t have a litre jug to mix my boiling water and stock cubes I mix one stock cube with 500ml of boiling water and I use this to start with until I have 200ml left then I add the next cube and top it back up to 500ml. Heat a good splash of olive oil in the bottom of a saucepan and tilt it to ensure the oil goes halfway up the sides. Slice the onion and soften in in the saucepan until it starts to get slightly translucent. Turn the hob down to just above a simmer and add the risotto rice and stir to coat the rice in the oil. At this point you can add a glass of white wine and stir until it has evaporated but you can just go straight to the stock. Add a little of the stock (about a ladle) and stir in. Now add the frozen peas and another ladle of stock and stir. 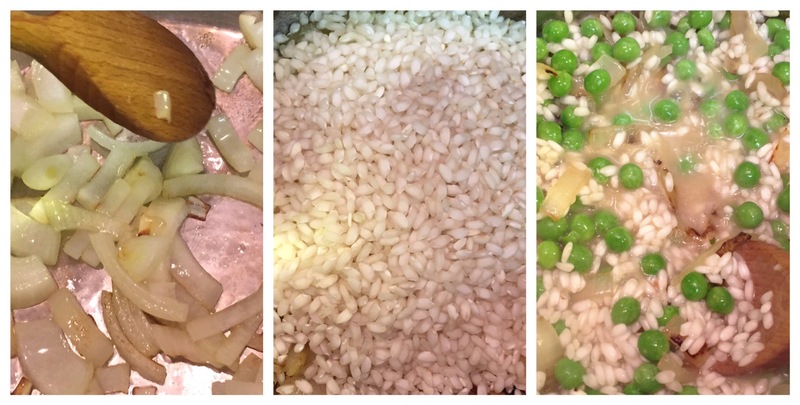 Every minute give the risotto a stir and add more stock by ladle amounts when the liquid in the risotto is nearly absorbed. Ensure that you move all the rice so go up and down with the spoon to make sure no rice is sticking to the bottom as this is when it gets burnt as well as the more natural stirring in circles. After 15 mins in the oven give the butternut squash a stir to ensure the cubes on top don’t burn. A tiny bit of char on the edges of a cube is good, not being able to tell the difference from coal is bad. 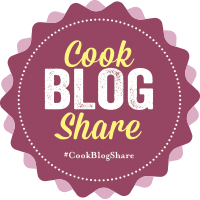 Slice the bacon into 2×1 cm strips and fry off in a good non-stick frying pan as this way you need no oil or additional fat until it just starts to become crispy. Tip into a colander over the sink to drain off any fat generated by the bacon. When about 600 ml of the stock has been absorbed spoon out half the roasted butternut squash into a bowl and lightly mash it (or if roasting the whole squash a quarter). Add the mashed squash into the risotto with another ladle of stock and stir. The risotto will change colour and become a light golden orange (if that is even a colour). Add in the fried bacon and stir through then add in the remaining squash to give some gorgeous chunky bits. Don’t worry if you still have little bit of stock left. Serve with some fresh salad leaves to add a bit more colour to the plate. I used a watercress and spinach salad as the rocket gives a lovely peppery bite but the water cress just tones it down a little. 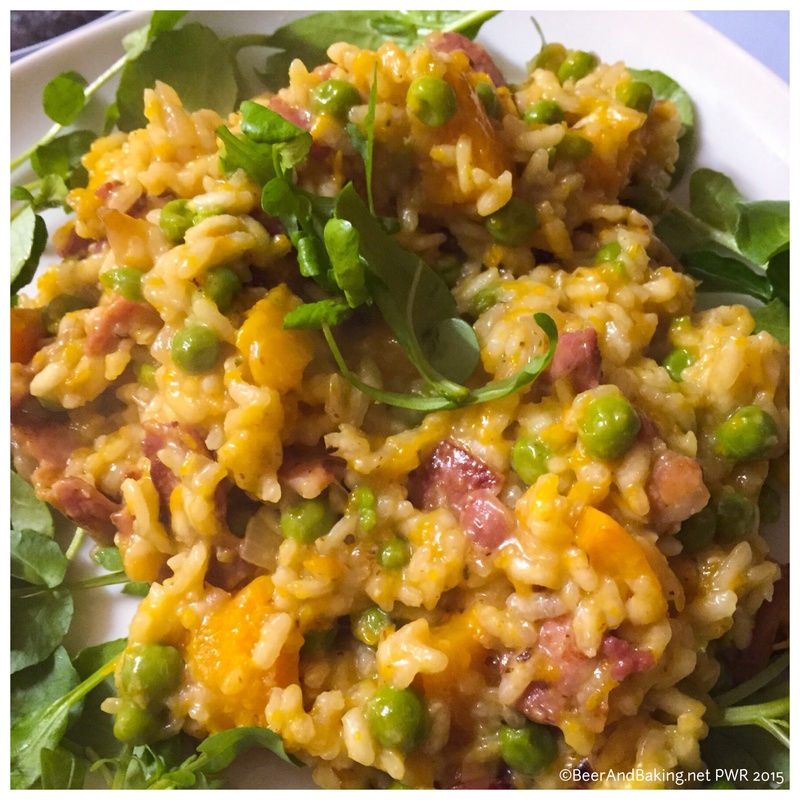 This entry was posted in Misc, Recipes and tagged bacon, Butternut, Butternut Risotto, butternut squash, colour, colourful, CookBlogShare, leftovers, peas, rice, risotto, Risotto Rice, vegetable stock, wine. Bookmark the permalink. Sounds like my kinda food !